Baby shower buffets are fun and delicious, too! Serving guests a baby shower buffet can take the worry out of finding the perfect shower foods. 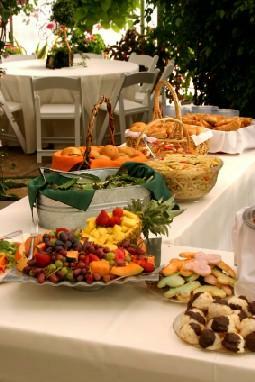 Buffets can include a variety of choices that are sure to please everyone at the shower. Do you need a little help planning a buffet? You've come to the right place! Keep reading for great buffet tips and ideas to help you as you begin planning a baby shower. Before you can begin creating the perfect buffet, you and the other hostesses will need to decide what type of foods you want to serve. This decision will depend upon the time of day that the shower will be held. Breakfast/Brunch: Breakfast or brunch baby showers are gaining popularity. Saturday morning showers enable the guests to come, visit, enjoy the shower, and then have the rest of the day to take care of their other responsibilities. Shower Luncheon: Shower luncheons are typically held around the middle of the day, so lunch foods will be appropriate at this time. Baby shower luncheons are also popular for workplace parties. Friends and co-workers can spend their hour lunch together, celebrate the impending birth of the new baby, and return to work at the end of the shower. While this will take some planning and may involve the help of several people, a workplace luncheon can certainly be a success. Shower Tea: Buffets can still be appropriate for an afternoon tea. The menu will consist of mainly finger foods, however. Baby Shower Dinner: Dinner showers are also fun, and they are often the choice for couples' baby showers. The dinner may be a sit down feast, but it can be focused around a buffet as well. Once you've decided upon the time of the shower, you can now begin planning the menu items. Typically, the foods you choose will echo the type of shower you are planning. Breakfast/Brunches: This type of buffet may include breakfast casseroles, quiches, fruits, pastries, coffees, teas, and other breakfast foods. Luncheons: Luncheons can center around cold cuts and breads; vegetable trays, chips and dip, and desserts; or lunch casseroles. Teas: Generally, baby shower teas feature light finger foods because this shower is held in the mid-morning or mid-afternoon between meals. Finger sandwiches and deli, fruit, or vegetable trays are staple tea items, as well as a variety of desserts, such as cake, brownies, and cookies. Dinners: Dinners can feature just about any type of food imaginable. Some like to plan specific ethnic dinners, such as Chinese, Mexican, or Italian. Others serve potluck buffets, with everyone bringing his or her favorite dish. For added fun, copies of the recipes could be included so that everyone has an opportunity to make the yummy dishes at home later. Cook-outs are also popular baby shower buffet fare, featuring burgers, hot dogs, ribs, steaks, and grilled chicken. For outdoor buffet plans, include an alternative indoor option as well. Plan on hosting the buffet in a room or area that is large enough to accommodate tables of food and lines of guests. Try to make the buffet as self-sufficient as possible. The hostesses want to enjoy the shower, too, so include plenty of serving utensils. Try to arrange for shifts of servers who are on duty to replenish empty serving platters and bowls, if necessary. Don't overlook a catered buffet as an option. Decorate the buffet table with paper tablecloths, flowers, cute baby items, and other centerpieces. Set up an extra table with dinnerware, eating utensils, etc. Consider buying attractive yet disposable plates, cups, and utensils to make cleanup a breeze.